Except as noted, prices are in US dollars, bold links are to outside sites, and regular links lead to 'Book profiles on Low End Mac. The New 15" PowerBook: A Laptop for All? "For the past week I have had as constant companion one of the new 12-inch PowerBooks and, although I am not about to change my view that the 15-inch machine is the best notebook I have ever used, this newcomer has powerful attractions. "It is the neatness of it that is so attractive. Among Wintel notebooks several, such as Sony's Vaio, are slim and pretty, but their compactness often means lack of optical drives, and few can match the little PowerBook's features and power...."
I do have a minor quibble with the LCD screens Apple uses. To be blunt: I want a higher-resolution screen.... Don't get me wrong. There's nothing inherently wrong with the current resolution; it certainly wouldn't stop me if I were eyeing a new PowerBook. "But given the higher resolutions offered on the PC laptop side (some of them too high, in my book), I'd like to see Apple offer more choice in its LCD screens. "Under the assumption that we'll be seeing G4 chips in PowerBooks for the foreseeable future, I hope that Apple will view new screens as a smart way to goose sales when it updates its PowerBooks down the road. "Because benchmark results from the Mac OS version of the GCN Lab's Alterion Corp. benchmark software differ slightly from those of the PC version, directly comparing the PowerBook G4 with the other notebooks in this review would literally be a case of Apples and oranges. "But after a month's use, I can say that the 1.5 GHz PowerBook with 512M of RAM and 80G hard drive multitasks on complex applications as easily as the IBM ThinkPad T42 or the Dell Latitude." "We finally got enough feedback to sum up what to expect by overclocking with iCook. "Everybody but one person seem to be able to gain at least 50 MHz, and one third of the testers have successfully pushed up to 100 MHz. "A lot of 900 MHz iBooks can reach 1 GHz." iCook only works only with PPC 750 FX equipped iBooks. "After about 6 months, my iBook started acting up. Files would disappear off of the hard drive, and then minutes later, the machine would freeze. Rebooting was impossible, as the hard drive appeared corrupt.... Shipping it off to Apple resulted in a new motherboard and hard drive. "On 19 April, my iBook started behaving strangely when I closed the lid to put it to sleep... When the lid was positioned at a certain angle, the backlight would shut off (anywhere in the 110-80 degree range), but the picture would remain on the screen. Later that day, the backlight stopped working completely. "After putting the iBook on the back burner for awhile,... I stumbled upon an Apple Discussion Board thread about this problem, and many were able to get the specific part for a mere $20 from Small Dog Electronics. I figured that I would give it a try and that in the worst-case, I'd be out $20. Apple Part #922-5017 was sent to me and I received it yesterday. "...sure enough, the inverter cable/reed switch component had 3 wire broken.... I now have a perfectly working iBook again...."
"Have you ever pulled you PowerBook out of your bag only to discover that it is hotter than a broiler oven? This has been happening to me with more and more frequency of late with my PowerBook G4 15-inch 1.25 GHz (Mac OS 10.3.3 and recently 10.3.4). "The most recent appearance of my Book of Fire was with no screen saver running and the machine completely asleep: I took it out of my bag to find its ambient temperature at around 120 degrees.... "
"Just today I finally ironed out all of the bugs (I hope) in the software, and also in the hardware. I'm just waiting for my remote control to come from Newegg.com . "Here's how it works: PowerBook G3 Lombard: Boots Debian-linux woody with my own custom kernel (powered off of cig adapter). LCDProc drives the screen (usb). I built a sheet metal + electrical tape case for the screen, and also put on a little power button. Once it boots, it auto-logs in and starts a set of perl scripts called CAJUN (Car Audio JUkebox Network or something like that). For now it uses keyboard input to control it, and it works quite nicely creating playlists and moving through them, etc...."
"Overall, I'm happy with the purchase, though I'll want to do some performance comparisons to see where this machine falls within the range of portables I've got here for review currently... I'm hoping its also a bit snappier than the 1 GHz iMac it's replacing." The Plasticsmith, Inc. has announced the release of its newest Lapvantage laptop stand - now at a lower price and with more options for the notebook user. It features height adjustability to position the laptop's screen at eye level, allowing users to work ergonomically without the eye, neck, back, and wrist strain usually associated with notebook computers. The CDC recommends against using laptops as primary computers unless they are used in a way consistent with neutral posture. Lapvantage can help make your laptop compliant with CDC's ergonomic guidelines at a fraction of the cost of docking stations and external monitors. Macworld's Mac Beat writes that Lapvantage lets "laptop users work in style as well as comfort." PC Magazine includes it in their High-Tech Holiday Gift Guide as one of their picks of "Gadgets for Grown-ups." MacOpinion's Road Warrior gives Lapvantage its highest rating. Now introducing a grey model to the line of already popular black and white models gives users one more color choice, specifically designed to complement Apple's line of laptops, each stand at the attractive price of $59.95, a 25% savings from the original price. Silicone feet are included to raise the laptop to keep it running cool, and now cord clips are included to reduce cord clutter. As more and more people are replacing their desktop computers with laptops, Lapvantage creates the ideal design to improve ergonomics and flexibility in height adjustment and swivel-ability. Its small footprint saves valuable desk space and allows for an external keyboard and mouse more suitable for comfort to be tucked under the platform. A new clear plastic slip-on shelf that sells for $12.95 is now available to support a USB hub or docking station. With docking solutions like Kensington's PocketHub USB 2.0 or a Kensington Portable Universal Docking Station, also sold by The Plasticsmith, Lapvantage helps turn notebooks into full-fledge desktop-replacements. 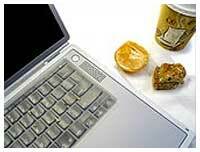 Under your iBook or PowerBook G4's keyboard lie all the important electronics that make it tick. If anything foreign gets in between your keys, it can pose a serious threat to your computer's health. If you love your iBook or PowerBook, you will want to protect it against the everyday hazards caused by spills, dirt, food crumbs, and other unwanted elements that may get on and in between the keys. 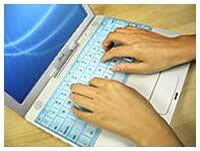 It also prevents the keyboard's keys from general wear and tear caused by everyday use. The ProTouch PB is designed to cover each key of the keyboard and create a non-slipping protective layer that allows you to type normally and comfortably. Since it's made of durable, flexible silicone, it's soft to the touch and dampens the sound of the keystrokes - handy when in quiet zones like libraries, meetings or classrooms. 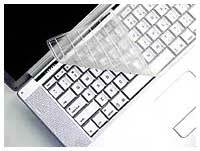 When washed regularly or removed before closing, the iSkin keyboard protector eliminates screen staining by reducing the occurrence of finger oils and dirt particles being transferred to the iBook/ PowerBook screen. The ProTouch PB Keyboard Protector is available in two transparent skin tones: Arctic (frosted clear) and Sonic (electric blue). Skin Tones add a splash of subtle color to the keyboard. The new ProTouch PB is offered through the iSkin Tattoo service with custom logos, web site addresses and corporate messages printed on the spacebar. Designed to fit all Apple iBooks, PowerBook G3, and PowerBook G4 . North American (ANSI) and International (ISO) keyboard compatible. MacMice, Inc. has announced that many of the company's previously discontinued acrylic products are again available to customers. A new website at has been launched to display and accept orders for several popular clear acrylic products that were discontinued over the past year by MacMice because of too-high production costs. At the persistent request of customers, the company has put these products back into limited production. Included in the reissue are the SightClip, iPerch, iBracket, iScoot, IceMate, and PodPerch. All are in stock today for immediate shipment. MacWay, the French leader in innovative storage solution for 13 years, has introduced what it claims is the largest capacity FireWire & FireWire 800 Hard drive ever made: the AluICE 400 GB. Featuring an industry first 400 GB single drive capacity, the AluICE 400 GB offers a whopping 60% more storage space than the biggest competing product, revolutionizing digital-media storage experience. To deal with such a volume of data, speed is the key, and so the AluICE 400 GB was built for speed : it combines Hitachi's latest and greatest Deskstar 7k400 7200 rpm 8 MB buffer 400 GB hard drive, with the fastest FireWire and FireWire 800 chipsets, yielding the best speed ever. With its FireWire or FireWire 800 & USB 2 Combo interfaces and its compact design, the AluICE 400 GB allows very quick and easy sharing of this staggering storage capacity that's worth more than 84 DVDs, 45 hours of HDTV broadcast or 100,000 high-quality MP3 recordings. But this breakthrough isn't the only one; the AluICE 400 GB is based on MacWay's brand new external hard drive "AluICE" lineup entirely made of plain Aluminum. This new design matching Apple G5's style, shares the innards of the unanimously press raved "ICE" FireWire hard drives and inherits all the qualities that made those the most awarded external Hard drives ever, by the French press. Totally silent fanless design allowed by an advanced passive cooling. Thick (1.8 mm), high quality, plain Aluminum material. Combo FireWire 800 & USB 2 version featuring triple interface solution: 2 FireWire 800 standard 9 pins connectors allowing high speed daisy chaining, one FireWire 400 standard 6 pins connector for direct compatibility with legacy computers, one USB 2.0/1.1 connector. FireWire 800, USB 2 interface. Available in the following capacities: 80 GB 7200 rpm, 120 GB 7200 rpm, 160 GB 7200 rpm (8 MB buffer), 250 GB 7200 rpm (8 MB buffer), and 400 GB 7200 rpm (8 MB buffer). Prices range are from 119€ to 499€ without taxes (142€ to 597€ including taxes). There are two different versions of WallStreet running at 233 MHz, the cacheless MainStreet version and the later Series II with a level 2 cache. It's not always possible to determine from the vendor's listing which is being offered, so we've included links within this paragraph to the two models. The same goes for the PowerBook G4/667 (Gigabit Ethernet/2001) and G4/667 (DVI) and the titanium vs. aluminum 15" PowerBook G4 at 1 GHz. Purchase with a one year extended warranty for $70 extra. For more deals on current or recently discontinued models, see our Best PowerBook G4 Deals, Best iBook G4 Deals, and Best iBook G3 Deals.